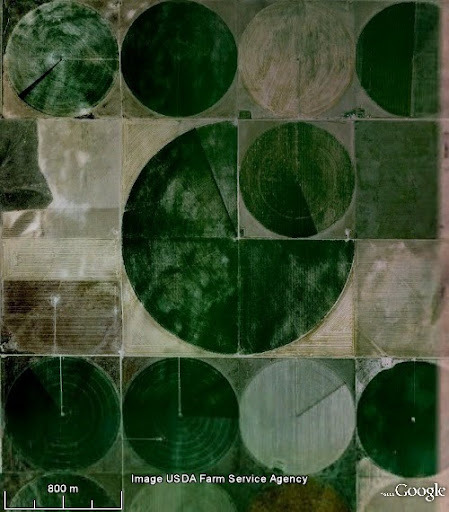 Huge circular patterns created by Central Pivot Irrigation are one of the most unusual and fascinating sights in Google Earth. 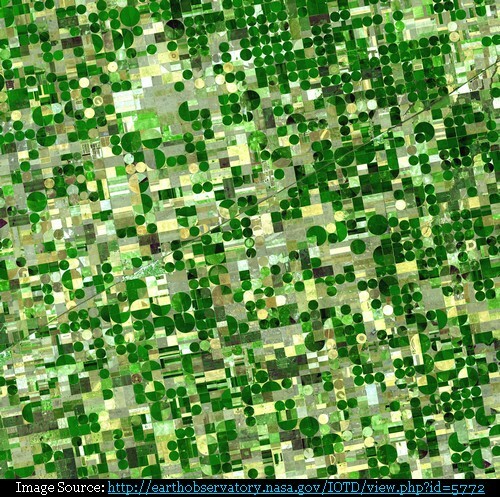 Central Pivot Irrigation is a technique of crop irrigation in which a large length of irrigating pipes rotates around a central pivot thus creating a circular pattern in crops when viewed from above. Several segments of pipe are joined together and supported on wheel mounted trusses with sprinklers positioned along its length. The entire piping system, which can be as large as 800-1000 metres, moves in a circular pattern and is fed with water from the pivot point at the centre of the circle. Such irrigation systems are generally suitable in flat terrain and are common in many parts of USA. Several other countries like Saudi Arabia, Libya, South Africa etc. have also adopted such a method of irrigation as it not only provides uniform irrigation but also helps in conservation of water. View these location in Google Earth or Google Maps. 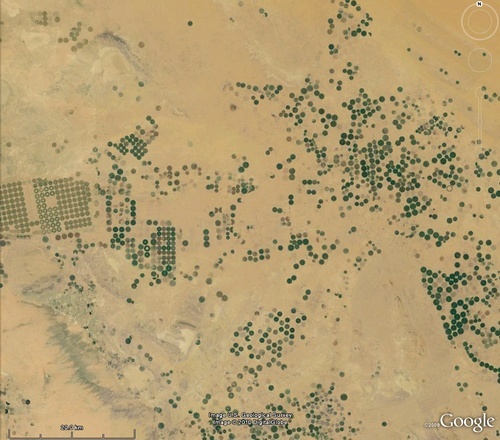 Now explore Google Earth/Google Maps and try to find some more of these fascinating circles. Happy circling!